The LoRa protocol and technology was developed by a startup called Cycleo which was acquired by Semtech back in 2012. Despite the creation of the LoRa Alliance, there have always been questions as to how open the standard really was if Semtech was the sole provider of radio chips. That began to change as the technology was licensed to STMicro and Microchip in 2015, and the first chips that weren’t built by Semtech started to go into production. But despite that, the diversity in the chip market for LoRa is still fairly sparse and a lot of production LoRa modules, like the RAK Wireless RAK833 or the Embit EMB-LR1301, are still built around the Semtech SX-1301 and SX-1308 chips. Unfortunately, both these chips can be difficult to purchase in small quantities making prototyping new projects harder. Which is why the arrival of the Microchip SAM R34/35, announced at this year’s electronica in Munich a couple of weeks ago, is more interesting than it might initially appear. Because any increase in the diversity of the LoRa chip market is crucial at this stage of ongoing standards war for the Internet of Things, signalling a maturing hardware market. The Microchip SAM R34/35 System-in-Package is an ultra-low power 32-bit SAM L21 Arm Cortex-M0+ with an integrated LoRa transceiver. Designed specifically for the Internet of Things and for remote sensor platforms that only wake up periodically to transmit small amounts of data, the chip can draw as little as 790 nA in sleep mode. The chip features a 6 × 6 mm BGA package with up to 256KB of Flash memory and 40 KB of RAM, 8KB of which is LP-RAM. It has a 12 Mbps USB interface, and up to five serial interfaces which can each be independently configured for UART, I2C, SPI, or LIN. There is also a 12-bit analog-to-digital convertor, and two analog comparators. The onboard LoRa stack has multi-region support, and tested interoperability with major vendors, including The Things Network. 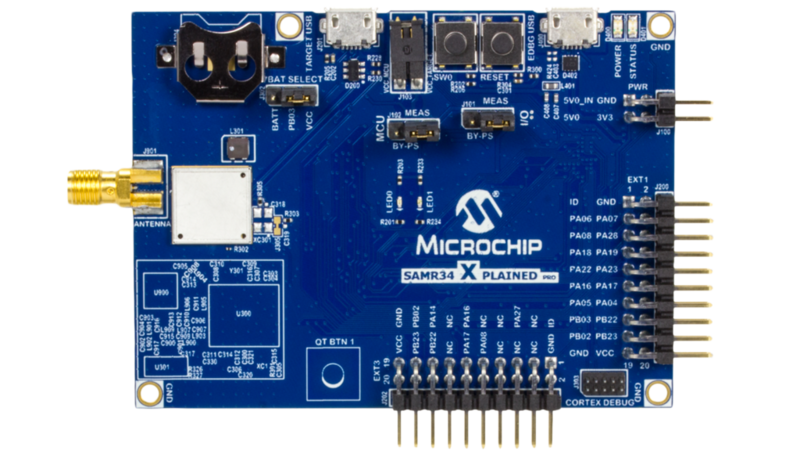 There are certified reference designs, but if you just want to play around with the chip then Microchip has built an evaluation board called the SAM R34 Xplained Pro, which can serve as a reference design, available for $99 per unit. Microchip’s SAM R34/35 LoRa chip comes in in six variants, with slightly different memory and interface options. The SAM R34 is available in a 64-lead TFBGA package beginning at $3.76 each in 10,000-unit quantities. While the SAM R35 devices are available, without a USB interface, starting at $3.66 each in 10,000-unit quantities. A New Ultra-Low Power LoRa SiP from Microchip was originally published in Hackster Blog on Medium, where people are continuing the conversation by highlighting and responding to this story.